I wanted to see as many islands as possible...this was the right ticket! From the first view on the first day of Saba Island (on our way to St Kitts) to old San Juan, was perfect! Weather was iffy in some ports, but that’s life. Freedom of the Seas was wonderful, even with an inside cabin. We enjoyed a drink/internet package and specialty dining; Bull &Bear became a regular hangout before dinner. There were so many ports or call, there was no time to be bored. Staff was friendly and helpful, food was wonderful. Found lovely areas to read my book, enjoying an adult beverage most days. Only downside was confusion during embarkation outside terminal in San Juan, however after getting inside and on line, process went smoothly. Cabins were ready quickly so we were unpacked and fed and hydrated well before muster drill. Cabin was inside, but roomy. There was lots of storage for a seven day cruise. Totally enjoyed my seven days aboard Freedom of the Seas! I wanted to see as many islands as possible...this was the right ticket! 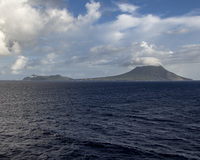 From the first view on the first day of Saba Island (on our way to St Kitts) to old San Juan, was perfect! Weather was iffy in some ports, but that’s life. Freedom of the Seas was wonderful, even with an inside cabin. We enjoyed a drink/internet package and specialty dining; Bull &Bear became a regular hangout before dinner. There were so many ports or call, there was no time to be bored. Staff was friendly and helpful, food was wonderful. Found lovely areas to read my book, enjoying an adult beverage most days. Only downside was confusion during embarkation outside terminal in San Juan, however after getting inside and on line, process went smoothly. Cabins were ready quickly so we were unpacked and fed and hydrated well before muster drill. Cabin was inside, but roomy. There was lots of storage for a seven day cruise. Totally enjoyed my seven days aboard Freedom of the Seas!